By 1990 there were approximately 200 million guns in private hands in the United States, and around half of American households contained a gun. Over 30,000 people a year are killed with guns in suicides, homicides, and accidents, and Americans use guns for defensive purposes as many as a million times a year. There is little doubt that gun violence and control are issues of vital importance, and they continue to inspire national debate. It is doubtful, however, that most gun debates are worth listening to. Not surprisingly, they generally leave their participants exactly where they began, with their biases intact, and onlookers perplexed. Written deliberately to counter an atmosphere of hysteria and extremism, Point Blank, now in paperback, offers logical argument supported by empirical information. It confronts fundamental questions head-on. 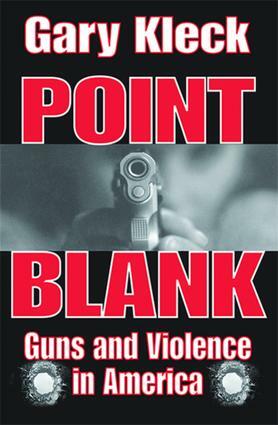 On its initial publication in 1993, Point Black won the Michael J. Hindelang Award of the American Society of Criminology for the book that "made the most outstanding contribution to criminology," Point Blank reports both original research and assesses existing evidence drawn from a wide variety of academic disciplines, including criminology, sociology, law, and medicine.